1066. During the Spring and Summer Duke William of Normandy prepares his Armada. Duke William of Normandy has been betrayed by Harold and considers himself to be the rightful King of England. He prepares an armada of ships to carry the men, horses and the armaments he will need to defeat King Harold. Trees were felled and boats built. Armour and spears were made. Provisions were collected and loaded on to the boats. Horses were acquired and loaded onto boats. The wind and tides were against the armada sailing for England. 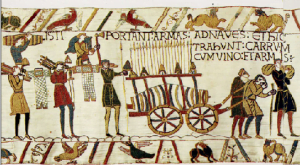 William and his army waited in France while Harold and his army waited for them in southern England. The English army became bored and restless and some went home for the harvest. The wind and tides, however, had been helpful to the Vikings who attacked in north east England leading to the battles of Fulford Gate and Stamford Bridge. The tapestry is really an embroidery. It is stitched on linen fabric using seven dominantly coloured wool threads. The stitches used are stem stitch, Bayeux stitch, (which is a form of laid work), and satin stitch. Notice the style of the design. The artist was gifted at showing detail and realism and in connecting the various scenes into a continuous flow. There is also a lot of energy and action in each scene which does not get lost during the process of stitching. It is 230 (or 270) feet long and 20 inches wide, The borders, top and bottom, are each 3 inches wide. They show birds, animals and incidents from Aesop’s fables. In the battle scenes, they show archers in action, fallen soldiers and horses. There are 8 lengths of fabric stitched together to achieve the total length of 230/270 feet. There are 50/74 different scenes depicted. You will observe that the information is variable according to source. It is all of interest to historians who see it as a revealing glimpse of life in the era before the Middle Ages. Yes, it is all very interesting but you have to know what you are looking at to appreciate the details. 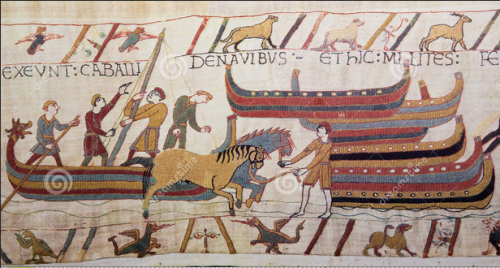 Kits are available from various resources if you would like to create a replica of a section of the Bayeux Tapestry. Tomorrow: September 20, 1066. The Battle of Fulford Gate. Thank you for this, Ann. I was fortunate to be able to go to Bayeux to see the embroidery and how well it was displayed. Interesting, I hear it is going to be moved to UK sometime soon, wish I could make a trip to see it again..
Peggy, Thanks for your response. 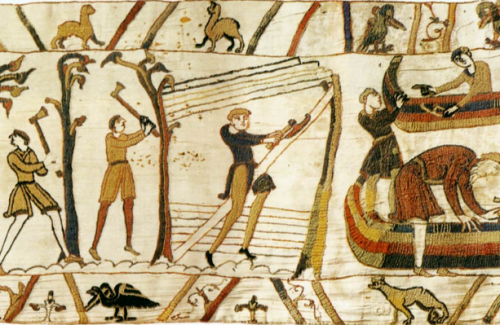 Lucky you to have actually see the Bayeux Tapestry. I totally understand that you would like to see it again. Yes, it will be in London – somewhere= around 2020 – 2022. I would like to dream that I might go and see it bu.. it is doubtful.